Supergirl is one of the first prominent comic-book films made to feature a female heroine as the lead (in fact, the first in the English language). This makes the film significant in some respects for that reason alone. Before Gal Gadot's Wonder Woman became a cultural milestone and before the Marvel cinematic universe introduced us to Scarlett Johansson's badass Black Widow this film introduced audiences to a female comic-book hero at a time when cinema had none in a lead role. 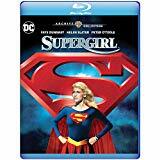 Starring Helen Slater as Supergirl and featuring a cast that includes Hollywood favorites such as Faye Dunaway, Peter O'Toole, and Mia Farrow the film was a box-office bomb, received negative critical reviews, and did not manage to make much of a cultural impact. The film landed flat with audiences and critics alike. Yet the film still has it's loyal fans who enjoy it in the pantheon of the Superman saga. The storyline alternates between focusing on the super-heroic events of Supergirl as she fights down bad-guys, including the dastardly witch Selena (Faye Dunaway), and the normal day-to-day routine of Supergirl's alter ego Linda Lee. Linda attends college and juggles her studies with being a superhero. Linda also finds some romance along the way with a bumbling guy named Ethan (Hart Bochner), who was placed under a supernatural love-potion by the witch Selena. Instead, it accidentally found it's way to Linda instead but Ethan starts to form real feelings for her after getting to spend time with her. It's a huge shame this film wasn't a runaway success both artistically and commercially as the universe could use more female superhero films (and it's unfortunately taken studio executives and marketing heads decades to realize that a female-centric comic-book film can also mean big business despite the success of other action film series with female leads: for example, Sigourney Weaver in the Alien franchise or Kate Beckinsale in the Underworld films). The film has good intentions and is notable for trying to make progress for cinema with a female comic book action hero. Unfortunately, though, the negative critical reactions to the film upon the film's release aren't wrong. The film feels somewhat lazy, uninspired, and feels like a big step down from the iconic Superman feature starring Christopher Reeves. By comparison, it's hard to not see the faults in this less ambitious effort. It's ridden with poor storytelling and average filmmaking. The film made it's first mistake in hiring a male director who seemed too preoccupied with how he frames the image on Helen Slater. One of the key lessons Hollywood should hopefully have learned from the success of Wonder Woman is that more female filmmaker's are needed behind the camera. Patty Jenkin's direction always highlights Gadot's beauty without being gratuitous or voyeuristic, something which is much more common with male directors. Jenkins also gave Wonder Woman a female perspective (something which is sorely needed in more movies, period). Director Jeannot Szwarc (Jaws 2), on the other hand, feels like a work-for-hire director in his role and doesn't give Supergirl the sort of originality or flair it drastically needed. What can you expect from the same director who gave Jaws 2 a rubber shark scene after Spielberg's masterpiece scared people to go into the water? Szwarc's style feels formulaic and remarkably average. The screenplay written by David Odell (Masters of the Universe) is cookie-cutter and lacks character development or depth. The love-potion romance storyline doesn't feel genuine and believable, either. Unfortunately, Supergirl feels less like an effort made in furthering female empowerment by creating a fully realized female hero and instead more like an effort made by the director to make a comic-book fanboy's crush become a cinematic realization. This makes the film feel dated and out of place in the legacy of comic-book films today. Supergirl also borders on even feeling like a made-for-television movie and never feels as ambitious or as well-produced as it should have been. Despite the film's lackluster and uninspired creativity behind-the-scenes, Helen Slater does a good job in the lead role and certainly still demonstrates charisma and enthusiasm for her part. The film is a more entertaining experience because of her efforts. Alongside some legends like Faye Dunaway and Peter O'Toole, Slater stands her ground. Even with how silly the film gets at times it still manages to find some entertaining scenes with its cast. Another good aspect of the film is the score composed by Jerry Goldsmith (Star Trek: The Motion Picture, Planet of the Apes, Poltergeist, Gremlins, The Mummy). Goldsmith was originally considered for scoring duties for Superman before John Williams stepped in. Goldsmith, one of Hollywood's best composers in the legacy of film scores, adds enough creativity to this film to make it more enjoyable simply through his strong music compositions. Supergirl is a bit of a empty train wreck of filmmaking made slightly more bearable by its good score and cast. It's cheesy and silly enough to be a moderately entertaining mess. It's not as well made as it should be. It's not as entertaining as it should be. It's not the beacon of things to come for female-centric superhero films, as it should be. The Blu-ray release arrives with an impressive remaster by Warner Archive. Presented in the original theatrical aspect ratio of 2.35:1 widescreen, this is a strong1080p MPEG-4 AVC encoded presentation with high bit-rates hovering around 40 mbps. The quality of the encode is impressive (as it the norm with Warner Archive). The film itself doesn't look overly polished but the transfer preserves the film grain and detail with great precision. This is a faithful and effective presentation of the international version of the film. Supergirl is presented with a lossless audio 5.1 DTS-HD Master Audio presentation. The film only occasionally uses the surrounds for effects and panning but it allows the score composed by Jerry Goldsmith to sound more enveloping. The Making of Supergirl (50 min.) features behind the scenes footage of the filming of the movie, interviews with cast and crew, and showcases footage of the filmmaking as it unravels during some sequences. Director's Cut (DVD only) with extra footage not in the international version as presented on the Blu-ray. Supergirl is a disappointing film which doesn't live up to its potential. Helen Slater does well in the role but uninspired direction and a weak screenplay make this a less effective production. Warner Archive's Blu-ray release, on the other hand, has an excellent presentation and some worthwhile supplements.